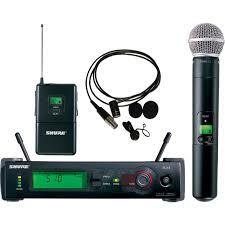 Avrexpos Wireless Microphone Kit Rental are a professional wireless system. Our kits are the perfect combination for use in presentation, trade show and meetings. Our wireless microphone kit rentals have been used by the best in the industry. So you know you’re getting quality equipment at a fair price with us. All wireless kits includes a Transmitter, Handheld Mic, Body Pack and Lavaliere Mic. AVRexpos will deliver, setup all wireless kits, for truly turn key experience. Order with us online Today for your instant quote! We carry a large inventory of microphone rentals. Push to talk microphone: gooseneck microphone with. supercardioid pickup helps focus on the speaker’s voice. Push to Talk Microphone Rental ($65.00) This must be a number! Podium microphone: gooseneck microphone with. supercardioid pickup helps focus on the speaker’s voice. Podium Microphone Rental ($55.00) This must be a number! 8 Channel Professional Mixer ($135.00) This must be a number! 12 Channel Professional Mixer ($235.00) This must be a number! 16 Channel Professional Mixer ($295.00) This must be a number! 10 Inch PA Speaker w/tri-pod stand ($105.00) This must be a number! 12 Inch PA Speaker w/tri-pod stand ($135.00) This must be a number! 15 Inch PA Speaker w/tri-pod stand ($165.00) This must be a number!